Sometimes Windows alerts you to events with sounds. If you have hearing challenges, you might prefer to get visual cues. It’s a fairly simple process to change this on your laptop. 1From the Control Panel, choose Ease of Access. Click the Replace Sounds with Visual Cues link. 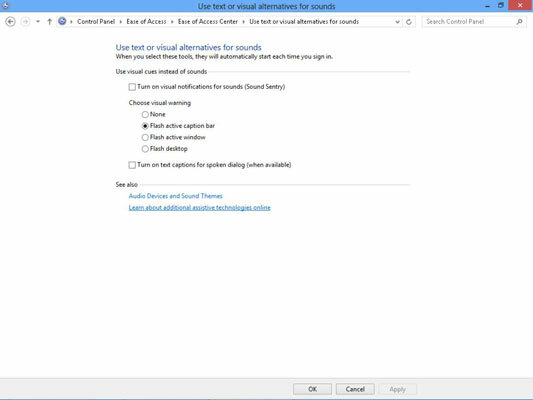 Select the Turn on Visual Notifications for Sounds (Sound Sentry) option so that Windows gives you a visual alert when a sound plays. Choose a warning setting for visual notifications. These warnings allow you to choose which portion of your screen flashes to alert you to an event. To control text captions for any spoken words, select Turn on Text Captions for Spoken Dialog (When Available). Note: This isn’t available with some applications. 3To save the new settings, click OK, and then click the Close button to close the window. Visual cues are useful if you’re hard of hearing and don’t always pick up system sounds that play to alert you to error messages or a device disconnect, but the setting may annoy other users of your laptop. After the setting is turned on, it is active until you go back to the Use Text or Visual Alternatives for Sounds window and turn it off. This may seem obvious, but if you’re hard of hearing, you may want to increase the volume of the speaker sound. You can modify your system volume by pressing Win+I from the Start Screen, and then clicking the Volume button and using the slider that appears to adjust volume up or down. Most laptop keyboards also offer special volume keys you can click to quickly adjust system sounds.